I wanted to go back a bit and add to the investment series that we had started up a while ago. The start of a new year is always a great time to re-evaluate your retirement contributions. I always wait until the first paycheck of the new year so I can see how the new health/dental/HSA deductions will affect my take home pay, then I re-evaluate if I should increase the amount that I’m putting into my 401(k). Since I was already contributing 17% of my salary to my 401(k) – ($10,698 per year), and because my take home pay actually dropped by $30 per paycheck this year after an increase in insurance costs, I have decided to leave it where it is for now. When we have our annual raises in a March I will still leave it alone and let that pay raise add to the amount that is being invested. – We digress in conversation but I wanted to let you all in on my personal situations and reasonings before continuing too far. The main point of this post it to convey the 2017 contribution limits for 401(k)s. So here we go. But what does this chart mean? We first have to understand that the IRS limits the amount of money that you and your employer can contribute to your 401(k). While most companies force you to make your contribution elections in the form or a percentage of your salary, the IRS’s contribution limits are set as strict dollar values, regardless of your income level. So, an employee with a salary of $100,000 they wouldn’t be able to set their contribution percentage any higher than 18%. This year an employee is only allowed to contribute a total of $18,000 to their employer sponsored retirement account. However, if you are over 50 years of age the IRS apparently assumes the worst and thinks that you haven’t been saving for retirement very wisely. So they allow you to increase your contributions by $6,000 per year, for a total contribution amount of $24,000. This is what they call the “Catch-Up” provision. But, since I am preparing myself to retire early and don’t plan on having a full time job when I’m 50 I generally ignore this number. It’s also important to note that this contribution limit is set to cover the entire year, regardless of how many employers you might have during that time. 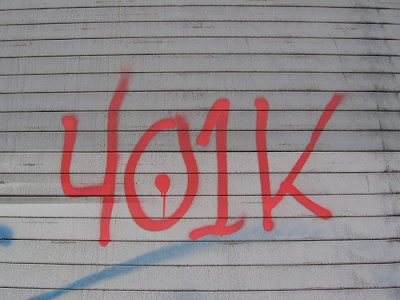 Let’s say that you leave your job in June and have already contributed $9,000 to your 401(k). But your new employer is amazing and offers a 100% company match for every dollar that you put into your 401(k). While it might be tempting to drastically boost your savings rate and try to contribute $18,000 with your new employer before the year ends so that you can collect the full $18,000 worth of company match, you can’t because it would mean that you had contributed a total of $27,000 of your own money that year. This year you can still only contribute another $9,000 and collect the $9,000 of the company match. But next year you’ll be all set up to kill it! But what if I can/want to save more than that limit for retirement? Here are a few different solutions that you can look into. 1) Open an IRA on your own through a brokerage. I would chose Vanguard personally but there are several other options out there. This will allow both you and your spouse to contribute another $5,500 each to a pre-tax account. 2) If your employer offers an HSA you can contribute up to $6,750 per family with pre-tax dollars. You can use this money for medical expenses at any time but after you turn 59.5 this account can be combined with your 401(k). 3) Open a taxable investment account and you can invest as much as you want with post-tax dollars. 4) I’m sure there are more creative ideas out there but I can’t think of any right now. So please let us know if you have one. My goodness, how I love hot chocolate!